Count Olshonsky points towards the entranceway where a crowd is gathering, and a steady crescendo of clapping hands snuffs out the background chatter. I look over in that direction but cannot ascertain the source of the disturbance. “Whom are you talking about? What are they clapping over?” I ask the count. Hold your heads up and don’t be shy! Thou hath the power to face it and beat! Shall never rival the kind which is insane! I am not left in suspense much longer. The crowd parts like the Red Sea to reveal the source of all the amusement, and the rhyming sensation proceeds down his personal avenue. My God, he found me! I don’t know how, but he found me! It is the same inexplicable entity that had poisoned my welcome into this underworld. The five-foot fiend with the mischievous smile moves in my direction while kicking up his legs and throwing up his arms in a spastic little dance. He twirls around like a nimble ballerina on one foot, while the three bells protruding from his hat spin furiously around his head. They chime in unison as the ceiling light reflects off their polished surfaces. He stretches out his bauble at arm’s length and raises it up and down in jerky movements, which are out of sync with his dance steps. Notwithstanding the absence of the pet serpent, everything else is the same—the clothes, the hat, the shoes, the height, the piercing eyes, the crafty smile, and the incessant rhyming. Here is unspeakable, unlimited evil, which paradoxically inhabits the limited boundaries of a silly little man. If infinite God had once dwelled in the body of mortal man to redeem the world from its sins, then this jester is Satan’s counterpart, designed for the sole purpose of enveloping his “redeemed” in the quagmire of iniquity. Satan’s progeny is not the result of an immaculate conception within the womb of an unsuspecting virgin, but rather the impure remains of a botched abortion in Bedlam’s bordello—the vaginal refuse of the Whore of Babylon! Go ahead and keep clapping, you fools! I think. Fuel his fire; there is more than enough to consume all of you many times over! Does no one else know of this clown’s true identity, or am I the privileged, chosen one who received this revelation? At least I am not alone this time. This is what I get for killing myself! The pint-sized fool approaches the bar and leaps up on it with feline finesse, continuing his dance down the “catwalk.” With each swing of his legs, glasses are sent flying in either direction onto the floor. The shattering sound serves as a bizarre musical accompaniment to the jester’s jig. Spectators move back to avoid the projectiles, although their shoes and pants get sprayed with the spilled drinks. Jormundgand, none too amused with the mess, stands motionless with arms folded tightly and veins protruding from his forehead. 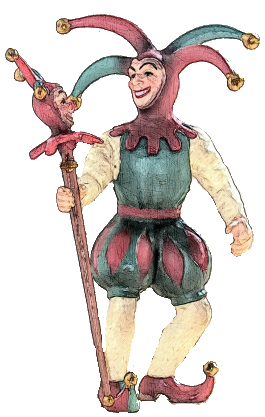 The jester sticks his tongue out at him and crosses his eyes, but the Nordic statue is unmoved. Nonetheless, he makes no effort to obstruct the little man in his chaotic course, as if hypnotized into submission. The broken glass collects on the floor as the puddles of beer, wine, and whiskey seep around the shards. The little river of libations creates an archipelago out of the larger pieces, which sparkle like jewels from the reflected light off the chandeliers on the ceiling. On concluding his dance, the little performer leaps off the bar counter, performs a somersault in midair and then lands perfectly on both feet, like a dexterous acrobat. His flawless finale brings forth abundant cheers from all corners of the room. The bar is wiped clean, fresh glasses set out, and drink once again dispensed in prodigious quantities. I feel the Lilliputian threads of indecision weighing me down, as I contemplate the options of either staying put or fleeing to another place. I will be hunted either way, by him or by Jedediah. I can’t take my eyes off of the jester, but am relieved to see that the demon’s attentions are directed elsewhere for once. He approaches a petite Aztec beauty sitting unattended at the end of the bar. She is even shorter than he is, but stunning with a light golden-brown complexion and an athletic physique. With almond-shaped eyes sheltering two hypnotic silver-black pupils, she looks hostile and alien to even the warmest smile. She has a broad, but strikingly aesthetic hooked nose. Her black, glossy hair is plaited and entwined with strips of multi-colored cloth wound around the head with great precision. Her cotton dress, interwoven with red-and-green, blue-dyed fabrics, consists of a sleeveless blouse and a long wrap-around skirt. Aztec blood. Watch out for his snake! Without turning her head, she shoots a quick peripheral glance at him but says nothing. He appears intrigued by her indifference. What a Casanova. How long has he been on the dating scene? This is the same diabolical runt who had me on the run? Gee, and I thought that I was awkward around pretty girls. Ha! Hmm … how soon before he is wearing that martini? The girl turns her head cautiously to see her rhyming suitor. His smile is so exaggerated that the ends of his mouth reach upward to the height of his nose in a “U” shape. He licks his lips slowly around the circumference of his mouth, then puckers them like a blowfish. She covers her mouth in an effort to suppress a fit of laughter, but the jester interprets this reaction as a positive reaction to his romantic overtures. Jormundgand and a few of the patrons take an interest in this interaction, erupting in laughter at her cue. A man with a very thin, long nose and a chapeau bra on his head is particularly amused and buries his head in his hands, as contractions from intense laughter shake up his entire body. The demon jester suspects that he is the object of ridicule and turns on his charm for damage control. Will you consent to be my prize? While giggling hysterically, she manages to let out an emphatic “Go away!” His motor mouth stops abruptly in a catatonic freeze, after which he politely bows his head in defeat. He stares inquisitively at the counter to digest the resounding rejection, and to review his pitch for any egregious mistakes. While the laughter dies down among most, the man with the chapeau bra continues in his fit of laughter. “C’mon, it’s not that funny,” says someone in the crowd. “It is to me! Why did you spoil it for me? Is it so bad that a man might have a little enjoyment down here? You’re nothing but a damn kill-joy! I hope you go to hell for this, Roland! Get out of my presence, now!” The man with the chapeau bra appears on the verge of losing control, and his face turns from alabaster white to red within seconds. The other man backs down and apologizes, then swiftly leaves the room to escape embarrassment and a potential violent reprisal. The man with the chapeau bra, now exhausted from the exchange, grows a long face and slumps over the bar. The room is quiet and still, as all heads are turned in his direction, waiting for a resumption of the outburst. With the wind taken out of his sails, a new placid state invites reflection. He mutters, “If heaven be close, then hell be much closer.” Picking up his glass of Malbec, he pauses just before sipping. The hand holding the glass begins to tremble. The hand is no longer visible and the glass falls to the counter, spilling the red wine. A nothingness quickly works its way up his body and down his legs. He vaporizes within seconds in front of everyone, but to nobody’s surprise, except for me, of course. The chapeau bra falls onto the empty chair, right side up. “Look at that! They left the hat! Damn, they hardly ever leave anything!” yells someone in the crowd. “I’ll take it,” says another. “What does respect have to do with anything? He has no use for the hat anymore. It’s better than someone sitting on it or stepping on it. Besides, I think he has more important things to worry about now.” The man walks over to the empty chair, picks up the hat, and turns it around for a little inspection. He then comfortably fits it on his head. “I’d say it is almost tailor-made for me. Now I know why they left it behind! I do think I’ll be taking this with me wherever I go from now on.” He breaks out into an over-exaggerated chuckle. The onlookers stare at him but remain quiet. My attention had been completely diverted from the clown to the man wearing the chapeau bra. Dismissing the count’s question, I ask about the man’s disappearance. “Oh, so you’ve never seen that before? Well, you won’t give it a second thought after a while. We all go that way, but not necessarily to the same place. Ha-ha.” He gives me an affectionate pat on the back. “Of course I am. We are all afraid. We don’t know where we are going and how much time is left. We see people disappear and know that we will meet a similar fate. You will go mad if you don’t learn to control your worries and fears. We are not designed to suffer from perpetual dread, as a healthy dose of denial must eventually anesthetize you to this. So drink more and talk more, and the rest will take care of itself. Oh, and of course, avoid Jedediah! He is sure to put a damper on your spirits!” The count politely excuses himself and exits the room.